Yet that short war led to long-term changes for America. Victory made the United States an increasingly important world power. This week in our series, Larry West and Shep O'Neal tell about those developments. LARRY WEST: The United States received several of Spain's island colonies as part of the peace agreement. The most important was the Philippines. Many Americans thought the United States should not have overseas territories. But President William McKinley thought the Philippines were unprepared for independence. He decided to keep the islands and prepare the people for self-government in the future. 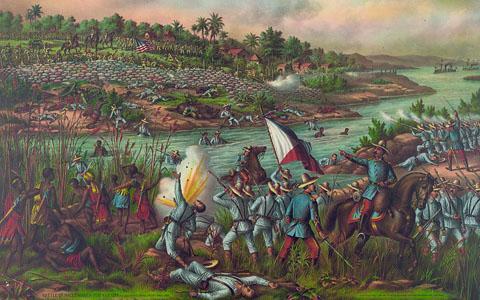 A Filipino nationalist group led by Emilio Aguinaldo rejected American control. Aguinaldo declared the formation of a Philippine republic. And he started a guerrilla war against the occupying forces. SHEP O'NEAL: The rebellion in the Philippines became a major issue in America's presidential election of nineteen hundred. The Republican Party renominated William McKinley as president. And it nominated a hero of the Spanish-American War, New York Governor Theodore Roosevelt, as vice president. The Democratic Party, for the second time, nominated Congressman William Jennings Bryan as president. It nominated a former vice president, Adlai Stevenson, as vice president again. LARRY WEST: William Jennings Bryan campaigned against the American takeover of the Philippines. He received support from a new group, the Anti-Imperialist League. Members included leading American politicians, businessmen, and writers. President McKinley did not campaign much. He let vice presidential candidate Theodore Roosevelt do it. Roosevelt spoke of America's success as a new economic and political power in the world. He said the Republican Party was responsible. The majority of voters liked what Roosevelt said. They elected the Republican candidates. SHEP O'NEAL: The Republican victory destroyed the hopes of many nationalists in the Philippines. With William McKinley in the White House again, they saw little chance of gaining independence. Nationalist leader Emilio Aguinaldo, however, refused to surrender. As long as he remained free, the guerrilla war would continue. For months, American forces tried without success to find him. Finally, with the help of a tribe of Filipino mercenary soldiers called the Maccabebe Scouts, they captured him. Aguinaldo signed an agreement to support the United States. With this agreement, the rebellion ended on the island of Luzon. But it continued for more than a year in the southern Philippines. Hostilities ended officially on July fourth, nineteen-oh-two. LARRY WEST: American occupation of the Philippines made the United States a major power in the Far East. As such, it began to develop new policies toward Asia. Especially a new policy toward China. Americans had been trading with China for years, but not heavily. As the American economy grew, however, businessmen saw China -- with a population of four hundred million people -- as a great market for American products. Other countries were interested in this market, too. Britain, France, Germany, Japan, and Russia all claimed special rights in parts of China. They began to divide the country into areas called spheres of influence. It seemed these areas could become foreign colonies. Then the United States would be cut off from trading directly with China. To prevent that from happening, American Secretary of State John Hay proposed what became known as the "Open Door" policy. SHEP O'NEAL: Secretary Hay asked the nations involved to agree to equal trading rights for all countries in all parts of China. No nation, he said, should interfere with the rights or powers of any other nation in China. No one welcomed the proposal. But no one rejected it, either. Most of the nations involved said they agreed with the idea. But they said they could not approve it unless everyone else did. Secretary Hay refused to wait for them to act. So in May, nineteen hundred, he announced that all the nations involved had given their approval to the "Open Door" policy. The new policy was tested very soon. Within a month of Hay's announcement, violence broke out against foreigners in China. LARRY WEST: The attacks were led by a secret group called Righteous, Harmonious Fists. Foreigners called its members Boxers. Boxers hated all foreign influence in China. They organized in areas where foreign influence was strongest. They killed Christian missionaries and Chinese who had accepted the Christian religion. They also destroyed foreign industries, especially railroads. The Chinese government in Beijing supported the Boxer Rebellion. It permitted the Boxers to occupy the capital. The rebellion lasted about two months. It ended when an allied force of American, British, French, German and Japanese soldiers reached Beijing and ended the Boxer occupation. SHEP O'NEAL: The foreign powers began to negotiate with China on paying for damages. The United States was worried about the results. It believed some of the nations involved would use the Boxer Rebellion as a way to gain more control over Chinese territory. Secretary of State Hay quickly announced America's policy on the issue. The United States, he said, wanted a settlement which would bring peace and safety to China. The settlement must protect China's territorial rights so it would not be divided into foreign colonies. Britain and Germany agreed. With their help, Secretary Hay got the others to accept money -- not territory -- as payment for damages. The final settlement forced China to pay three hundred thirty-three million dollars. The United States used some of its share to pay for the education of Chinese students in America. LARRY WEST: The results of the Boxer Rebellion and the Spanish-American War made clear that the new century would have a new world power: the United States. And this new power had a president with the political skills to do the job: William McKinley. In September, nineteen-oh-one, President McKinley made a major foreign policy speech at the Pan-American Fair in Buffalo, New York. He spoke about the importance and the promise of America's new position in the world. The next day, President McKinley went to the fair's temple of music. He planned to spend several hours meeting the public and shaking hands. SHEP O'NEAL: A young man waited in line to see him. When the young man stepped in front of McKinley, McKinley reached out to shake his hand. Two shots rang out from a gun the man had hidden under a cloth. One of the bullets struck McKinley in the stomach. The president was taken to an emergency hospital on the fairgrounds. He was not conscious. The bullet had damaged his stomach, pancreas, and one kidney. But doctors did not believe he was in danger of dying. LARRY WEST: The man who shot McKinley was Leon Czolgosz. Czolgosz was an anarchist. He believed all rulers were enemies of the people. He believed the people had the right to kill them. Czolgosz also was mentally ill. He had tried to join several anarchist groups. They refused to accept him, however, because of his mental condition. After shooting President McKinley, Czolgosz explained why he had done it. He said it was not right for one man to receive so much public honor, while he received none. SHEP O'NEAL: For two days, the president remained in a coma. Then his condition changed. He regained consciousness and was able to talk. He rested and became stronger. Then the president's condition changed again. An infection developed in his wound. It spread throughout his body. In another few days, he was dead. LARRY WEST: Vice President Roosevelt hurried to Buffalo. He went to the house where the president's body lay. Then he went to another house to be sworn in as president. He was forty-two years old -- the youngest man ever to hold the office. Roosevelt declared that the administration would go on as before. "It is my aim," he said, "to continue unbroken the policy of President McKinley for the peace, the prosperity, and the honor of our beloved country." ANNOUNCER: Our program was written by Frank Beardsley. The narrators were Larry West and Shep O'Neal. You can find our series online with transcripts, MP3s, podcasts and images at www.unsv.com. You can also follow us on Facebook and Twitter at VOA Learning English. Join us again next week for THE MAKING OF A NATION -- an American history series in VOA Special English. roosevelt declared that the administration would go on as before.